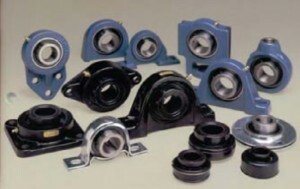 These units are a combination of a radial ball bearings, seal and a housing of high grade cast iron or pressed steel which come in various shapes. The outer surface of the matching bearing and internal surface of the housing are spherical so that the unit is self aligning. They generally consist of a duplex seal containing an oil proof synthetic rubber seal and a slinger on both sides of the bearing.